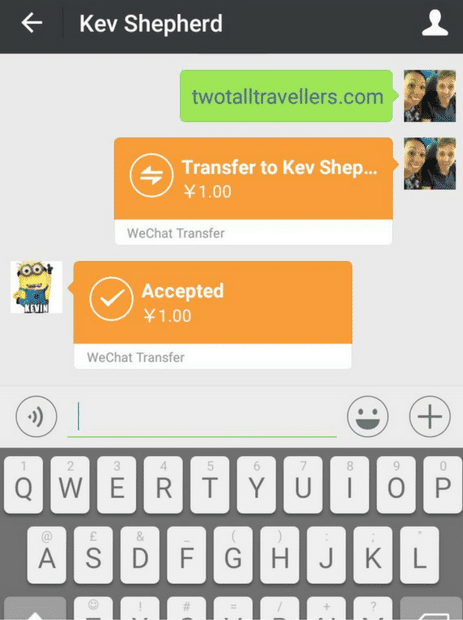 If you’ve not been to China, then you’ll very likely not heard of WeChat – we certainly hadn’t before we arrived. However, it’s something that made our lives a billion times easier over here, and something that we’ll definitely miss when we leave! If you’re moving to China then we would recommend downloading it as soon as you can! It’s essentially an amalgamation of WhatsApp, Facebook, Twitter and even ApplePay. Facebook and Twitter (along with many other websites) are blocked in China, mainly because the government wants their own businesses to succeed without interference from Western ones. WeChat has definitely done that! 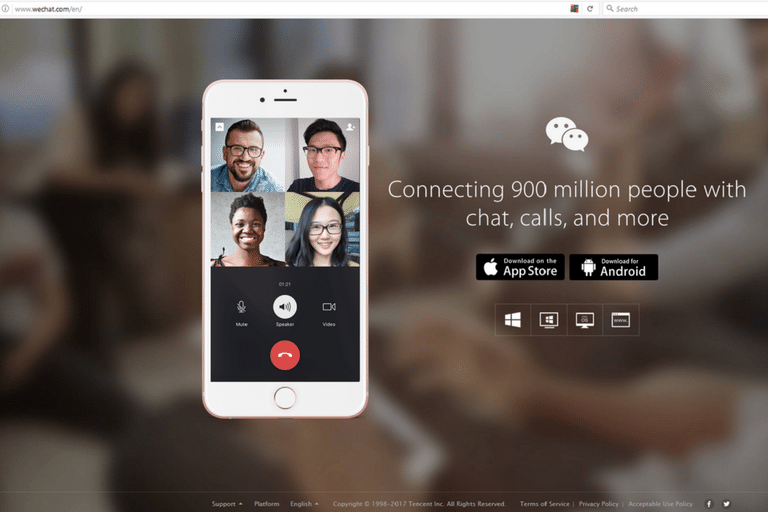 EVERYONE uses WeChat to talk to their friends, family and colleagues. It’s not as informal as using WhatsApp to talk about your contract with your bosses for example, and you can share your daily moments with anyone in your contact list, just like a news feed. There are also official accounts you can subscribe to – a little like following a Facebook page. Most companies have an account – from McDonalds to The Beijinger (great local news/blog site) to our own company. They’re handy to quickly scan through to check for any deals or offers going on! I know this doesn’t sound too different to anything we use back home but here’s the deal breaker for us. It lets you pay for basically ANYTHING! You can order a taxi with WeChat. Pay your gas bill or even buy cinema tickets, flights, phone credit….the list goes on. My favourite part is that you can pay anyone of your contacts because your bank card is linked to it, so if you ever owe anyone money you can whizz it over right away. Also, 99.999999% of shops, market stalls, restaurants and tuktuk drivers either have a QR code you can scan and pay with. If they don’t, they can always just create a temporary one on their phone and you can input the right amount of money in. As I mentioned before, you can also ‘recharge’ your phone credit – nothing to do with the battery of course, it’s basically topping up. Rather than getting a monthly bill, you can just add the correct amount on the date you arranged, and you have minutes, texts and internet straight away. For example, when we bought our phones and sim card, China Mobile arranged the money to come out on the 8th of the month. Sometimes though, we run out of minutes, so we can just quickly put anything from 30RMB to 500RMB on. Is WeChat Better than Facebook? I can’t tell you how much WeChat has saved our lives when we have run out of cash, or drained our bank accounts so much that we can’t withdraw anything because it’s less than a tenner. You also never have to worry about owing people money in cash because you can return it back in seconds! Don’t get me wrong, Facebook, Twitter and Instagram are all more FUN but that’s mainly because most people I know use those apps. My WeChat news feed is usually full of Chinese characters that I can’t read (although it does give you the option to translate) so I tend to ignore it. Still, if you’re moving to China, you’ll definitely understand why you’d need it very quickly – it’s just so useful! WeChat is not only a form of social media, but a way of spending your hard earned cash super easily– there’s nothing wrong with that, right!? Have you ever used WeChat? Do you prefer other types of social media? Let us know in the comments below! WeCat sounds like an all in one app for doing about 45 different things. I dig the functionality of it. As noted, it may not be as fun as Facebook or other sites but the end game of connecting and transferring funds or whatever makes this tool invaluable. Especially in a place like China where big social media sites tend to be blocked. Noted for future trips to any of these social banning lands. Exactly. To put it in persepctive, Me and Kev are still using wechat to communicate and we left China 2 months ago.